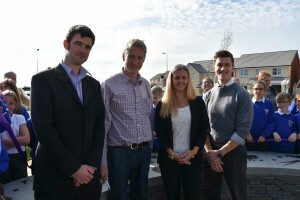 School of Physics and Astronomy staff, Professor Haley Gomez and Dr Chris North, were honoured guests at the unveiling of a specially commissioned art work at Channel Heights Housing Development (Rhoose Point, Vale Of Glamorgan) on Friday, 21st of October. 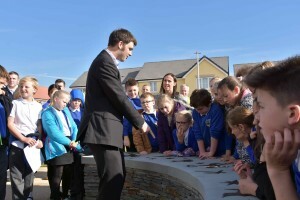 Students and staff of Rhws Primary School also attended the event and took part in a Question and Answer Session about “Space” after the unveiling. 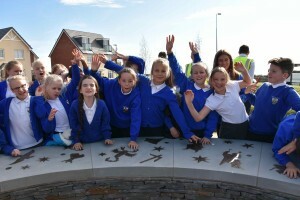 The project, which was to create an inspirational stand-alone artwork which would also function as a seating area for local residents, was commissioned by Vale of Glamorgan Council and Taylor Wimpey (South Wales). The public art work entitled “Constellations” was created by local artist David Mackie. who is based in Cardiff but has worked throughout the UK on site-specific workshops and permanent public artworks. As part of the public project David also led workshops with children from Rhws Primary School. His designs for this work have been influenced by the coastal panoramic position of the Channel Heights, which lends itself to the theme of star gazing as a visually rich, playful and educational theme. The artwork takes the form of a viewing platform: a low crescent shaped plinth in pennant stone. The surface incorporates a sequence of individual bronze reliefs depicting some of the constellations including Sagittarius, Aquila, Orion and Circinus. The star gazing viewing platform doubles as a functional seating area and an educational artwork. Positioned in Channel Heights public play area, the artwork creates a reference point for people of all ages to enjoy and learn more about the night sky together. It introduces the local community, and especially young children, to astronomy, and will help to feed their fascination with space.